A week ago my partner was at work wearing high heels and she felt a twinge of pain in her foot, but just assumed that it was minor and that it would be right once she got off her feet. That night she took her shoe off and couldnt place any pressure on her foot at all, and the joint area under the big toe was badly swolen. She has seen a doctor since (the next day) and was advised to and bandage it and elevate it. She was also advised to go back in a week if it hadnt shown signs of improving. It is now a week later and it hasnt really improved. Is this time line accurate (as some online accounts show if mistreated then the long term effects are more severe). Should she be seeing a specialist, and is it likely that continued elevation/compression etc is enough. Icing and resting an injury for more than about two days is usually long enough (I personally think that ice is mostly an overhyped therapy btw). If there has not been substantial progress by a week, one must suspect there is something more amiss than a simple sprain. The next step is to get a few xrays of the foot. There is a possibility that she has done damage to the small sesamoid bones at the base of the big toe region of the foot. She may have even pinged the tendon of the big toe. Most of these injuries can be figured out without the need for expensive imaging, if only the examiner would take their time, first in obtaining an accurate history, understanding the intricacies of foot mechanics and then palpating the foot effectively to locate the exact source of the pain. So, please go back to the doctor and see about getting a foot xray. Be guided, first and foremost, by what the doctor recommends because, he/she is there on the spot and I am not. Please send me the results of any further examinations and I may have some specific advice. 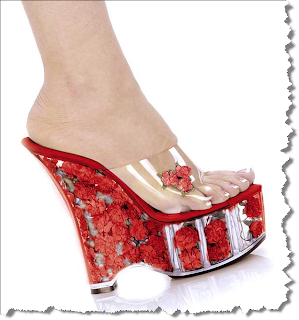 With regards to shoes: High heels are ridiculous items of fashion really! I personally much prefer the look of a woman in a tasteful pair of flats. Men look better in high heels. High heel shoes do all kinds of lasting damage to not just the feet but to the ankles, knees and even the low back. If your partner insists of wearing such items of fashion in the future, she should have a pair of flat shoes that she wears to and from work. While at work, there is no reason why she can not slip the high heels off when at her desk and around the "back of the office", reserving her high heels for those special moments in her day. Incidentally, I put high heels and bras in the same category - damaging to women's health (Bras cut off the lymphatic flow for the breast). As a woman, I couldn't be convinced out of my stilettos...until I hurt my foot from wearing them too much. I bough a pair of (very cute) Orthaheel flip flops from Foot Solutions, and wear them to protect my high arches. I've learned to wear heels ONLY when I have meetings- all other times I wear flats to work. The sad part is, I'm only 24....aren't I too young for foot problems? Stilettos just aren't work the risk anymore. I'd rather have pretty feet! While i look for the online page, I'm surprised. Personally i think you have many good thoughts. I'd prefer to become your good friend. Before I think a good pair of shoes as my faithful friend, i absolutely always discover the most suitable and favorite shoes, if you ever believe my view, you can look at my site.